Many people don’t know that when they lose teeth, they also lose bone. Our teeth are held in place by their roots, which extend into the jaw. When we lose a tooth, the body reacts by absorbing the minerals in the jawbone that once supported that tooth. This process of bone absorption, also called resorption, can lead to facial collapse and serious health consequences. When we lose just one or two teeth, the consequences of this bone loss won’t be that serious. But when we have lost all our teeth, this absorption process gradually dissolves away most of the jawbone. When that happens, the face takes on a characteristic shrunken look. This happens over a period of ten or twenty years. The picture at the left shows the progress of what happens to the jawbone in facial collapse. The first jawbone at the top still has teeth, which have maintained the health of the bone. The second shows how the loss of the teeth initiates the process of resorption, and the third shows even more loss of bone. The final one at the bottom shows what happens after ten or twenty years. There is not enough bone left to adequately support a denture. 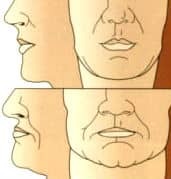 What are the Consequences of Facial Collapse? The drawing to the right gives a clear picture of what happens to the face when the jawbones collapse. And while facial collapse causes people to look much older than they are, the aesthetic consequences of facial collapse are only part of the problem. Loss of jawbone structure can make it impossible to support a denture because dentures rest on the ridges of bone left under the gums. 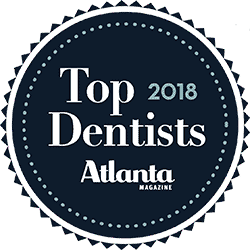 Once it becomes this difficult to support a denture, chewing efficiency is seriously compromised, and many people are relegated to eating only soft foods, which can lead to other health problems. Can Facial Collapse Be Prevented? Facial collapse can be prevented. It can even be treated, but prevention is much easier. Dental implants prevent bone loss because they are prosthetic tooth roots. When they are placed in the jaw, the body senses their presence and preserves the bone that supports them. That’s why dental implants are the gold standard of tooth replacement. And just a few dental implants can have the desired effect, because the jawbone won’t recede in the area of a dental implant. Implant supported dentures are becoming more and more common because they prevent bone loss that leads to facial collapse. Even if you are experiencing facial collapse, Dr. Pumphrey can perform bone grafting to build up the jawbone enough to support dental implants. In this case, your life can be dramatically improved, and you can experience the benefits of dental health again. You can learn more by reading our Implant Supported Dentures page and our Bone Grafting page. Then, if you’re ready to find out how Pumphrey Periodontics can help you, please give us a call or click here to request an appointment. We’ll be glad to help you find a convenient time that works for you.